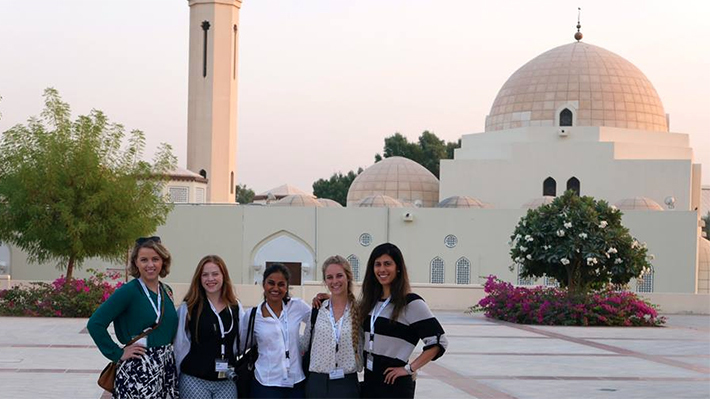 Emma Zdgiebloski never thought she would travel to the Middle East, but presenting her Drexel research in Qatar gave her the opportunity to see the Middle East a little differently. The prejunior business analytics and management information systems major was selected to present her research on information security at the inaugural World Congress of International Research in Doha, Qatar this November. She joined 160 other students from all over the world at Qatar University to present the research she began as part of the STAR Scholar program after her freshman year. Zdgiebloski’s research looked at college students’ knowledge and implementation of best practices to keep their electronic information secure. She found that college students know quite a bit about how to protect their personal information online but do not actively implement those practices. While she was excited to present her research, the highlight of the trip was the opportunity to learn more about Qatar and the Middle East by meeting students from Qatar University and visiting numerous cultural sites throughout Doha. The Souq Waqif, a traditional indoor market, and the brand new national laboratory stood out as highlighting the contrasting personalities of the country. For Zdgiebloski, experiencing Qatar first hand was a unique cultural experience, one she could have ever dreamed of. The World Congress was organized by the Council on Undergraduate Research to “bring together the best undergraduate research in the world to focus our collective minds on some of the most significant challenges facing the global community today.” Research topics ranged from biomedical engineering to sociology. Zdgiebloski attended the conference with Drexel biology student Rushi Thanawala and Suzanne Rocheleau, Director of the Office of Undergraduate Research, who sponsored her attendance. Following her STAR Research experience, Zdgiebloski became a LeBow Undergraduate Research Fellow. As part of this program, she works with LeBow faculty to supports their ongoing research projects. She is currently working with marketing professor Chen Wang, PhD. Outside of classes and work as a research fellow, she has not had much time to focus on expanding her own research. However, since STAR Scholars she has updated her literature review and conducted more student interviews to support her original data. She also presented the research at the National Conference on Undergraduate Research in Ashville, N.C. this past April. William Jefferson Clinton Scholarship winner Krishna Desai immersed herself in Middle Eastern culture and study for a new business perspective. LeBow undergraduate research offers student the opportunity to get to know faculty, explore a major area of research and gain practical research skills and experience. This competitive program provides an opportunity for freshmen to explore a discipline through a paid research assistant position. Research Fellowships allow undergraduate students to engage in high-level research with department faculty for 150 hours per quarter, putting them on the path to becoming research assistants. Studies in business analytics include coursework in statistics, operations research, management information systems, econometrics and modeling through the Business Analytics program in the Decision Sciences and MIS department.